Because it’s a lightweight, 60-mesh, polymeric grit, SEAL-KRETE Clear Non-Slip Additive remains suspended longer. It adds non-slip texture that increases durability and abrasion resistance of floor coatings. 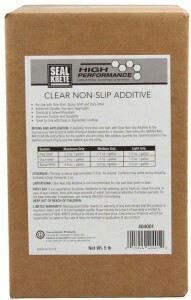 SEAL-KRETE Clear Non- Slip Additive can be used in 2-part water-based or solvent-based urethane, polyaspartic or epoxy coatings.